After Thanksgiving, our flight from Ketchikan to Juneau was delayed by mechanical troubles. Our Alaska Airlines jet pulled back from the gate on time, but during the pilots’ preflight check at the end of the runway, some sort of fuel valve indicator light wouldn’t turn off. The pilot informed us that it was likely just a problem with the light, not the fuel value itself, but at the very least we’d need to return to the gate so that the mechanic could fill out the appropriate paperwork.Back at the gate, we discovered that the mechanic had already gone home for the night. Makes sense, really. It was 9pm, and the last flight had already left the jetway (if not the runway.) Now we had to wait for the mechanic to be called back. Normally not a big deal, but congress made a stink about the Bridge to Nowhere, so Ketchikan travelers are still at the mercy of the airport ferry’s schedule. Over the intercom, we were informed when the mechanic actually did arrive, when he discovered that the fuel value was, in fact, faulty, and again when the job took longer than expected. I didn’t mind. I’d lost myself in Stephen King’s newest paperback, Cell. I barely looked up when they passed out placating coupons worth $25 or 1000 miles. After two and a half hours, however, it looked like they were going to cancel the flight. When the flight attendants announced that we could deplane and wait in the secured area, Oksana and I took them up on their offer. I figured that if the flight were to be cancelled, I’d want to be the first in line for new reservations. The flight was cancelled, of course, and if the rumors were true, not because of the mechanical difficulties. Rather, the time it took to fix the fuel valve pushed the pilots past their maximum hours for the day. Three hours on the tarmac was infinitely more enjoyable than the wait in line afterwards. Ketchikan is a tiny airport. It’s not unreasonable to expect that there would only be one employee manning the counter at 12:30am, but it still took him 25 minutes to process the first passenger. Eventually a second (then a third and fourth) employee were called back to work and the line started to move. People were justifiably tired but irrationally irritated. I felt as though I was the only person in line with any sympathy for the employees who were dealing with hundreds of grumpis maxima. My only complaint (through the entire ordeal) was that there were no announcements made after we had deplaned. A simple intercom statement letting us know that we would be put up in a hotel on Alaska Airline’s tab would have gone a long way towards calming people down. Eventually, we all received vouchers for cab fare, hotel room, breakfast, airport ferry tickets, and we were rebooked on the same plane the next morning. More than acceptable, considering the circumstances. By the time we got to the hotel, though, it was already 2:30am and we were due for a 7am wake up. Wouldn’t you know it, the next morning, high winds in Juneau delayed our flight another couple hours. A few weeks later we received a letter from Alaska Airlines’ Managing Director apologizing for the inconveniences we’d experienced. Included in the letter were two “eCert codes” good for discounts of $200. Oksana and I had used a $50 companion ticket on this particular trip, so our round-trip flight had cost us only $285.76. With the coupons we’d received earlier on the plane, Alaska Airlines was reimbursing us $450 (not even counting the hotel, cab, etc.) To say that I wasn’t expecting that level of corporate responsibility is an understatement. I’m writing to discuss the events surrounding the cancellation of Flight 69 on November 24, 2006. While an airlines can never make a pleasant experience out of a flight cancellation, Alaska Airlines did an admirable job in trying. While we waited on the aircraft for three hours, the flight crew periodically kept us informed and offered us refreshments. After the flight had been cancelled, Alaska Airlines staff came back to work in the middle of the night to expedite our processing. And, of course, Alaska Airlines paid for our ferry tickets, cab fare, hotel, and breakfast. To top it all off, we were reimbursed for our entire airfare (and then some) with eCert codes. It’s refreshing to see a company step up and do the right thing. Considering Alaska Airlines has a virtual monopoly on the market in Southeast Alaska, any negative publicity stemming from this incident likely wouldn’t have impacted your ticket sales. It’s my hope that by continuing to offer similar customer service, your company will gain a greater market share in the Lower 48. In the meantime, I’ll do what I can to spread the word by posting my take on the events surrounding Flight 69 on my weblog. Good work should be rewarded. I look forward to my next flight on Alaska Airlines. Arlo, this is very nice of you to respond to the airline. Any experience flying can go bad and complementing on any efforts to better the situation can be appreciated. Wonderful Alaska Air has a chance to charge $450 for 1 1/2hr flight from anchorage to juneau that stopped me from spending Xmas with you, but at least if their people screw up they are good about apologizing…. PS. did you guys really sleep for four hours at the hotel? You write something like that wondering if anyone will catch your meaning. I’m glad it came though. 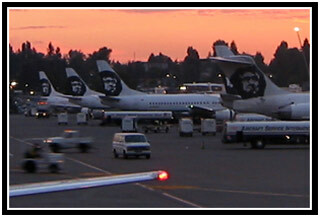 My father worked for Alaska Airlines after being hired from Tyee Airlines. He worked for AA 10 years. I remember flying “down south” a number of times and the experiences were always memorable as a youth. The thing I remember most was the service. I remember how I was doted on as a youth. Being an employee’s kid always garnered me a little more attention. But they still offered full meals when the other airlines were reverting to bags of peanuts. I remember seeing the pride on my father’s face when he told people he worked for Alaska Airlines. They have always been a cut above the rest in my book. Nice piece Arlo, you were always a bit more level headed than the rest of us. Yeah for you. It’s amazing how companies respond to positive letters. My rule of thumb is that if I send a complaint letter I also must find a company to thank. :).